You have lots of content languishing because it is older and "tired." And yet it is still valuable to your target audience. Now is the time to resurrect that content with these nine remodeling ideas. Throwback Thursday. This has become a common term on social media. Members post old pictures from days gone by, and all of their communities make comments and discuss those times. It's fun. Throwback Thursday should be something that bloggers think about too - especially those who provide content for enterprises. If in fact, a business blog has been around for some time, there is a lot of past content that is languishing out there with no more "play," that potential readers do not know exist. It is perhaps old enough that, even though the topic may be "evergreen," a Google search will not reveal it. It's time to go back and look at that old content, assess its value, and perhaps find ways to bring it up to the surface again. Much can be done with old content, and re-purposing it may bring in new audiences and thus new leads. 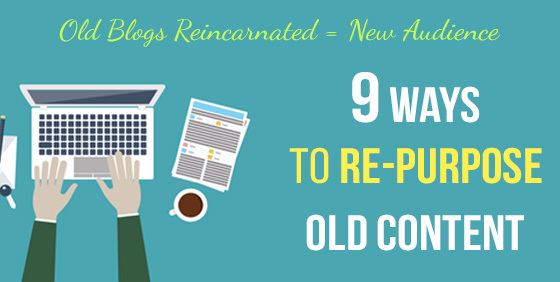 Here are nine ways to think about re-birthing that old content. Topics that are still "hot": If you are keeping up within your niche, you know what your competitors are writing about, and you know what discussions your target audiences are holding. Make a list of those old posts that address these topics. Go through your analytics: You have run analytics on your posts, right? List those that, over the past year, were most popular and got the most readership and discussion. New personas: If you have expanded or are attempting to expand your audience, you should have developed new personas. Look through those topics and see which ones would be appealing to these new personas. Keep valuable posts: Sort through your list and, just for now, eliminate those topics that are not evergreen - that will probably not be timely over the next 6 months to a year. There are lots of ways to re-purpose old content. Now that you have your list, take a look at all of the options and choose those that work best for each post you have decided to resurrect. This is one of the easiest and perhaps the most effective thing to do. Suppose, for example, you wrote a post on live streaming a year ago. How much has changed since then? A lot. There is new technology and there are new ways to use live streaming in marketing and on social media. The same goes for most every business niche. What are the newest trends in the topics you wrote about back then? Re-write the post adding this updated information, give it a new title, and post it as brand new. You may have written a post with valuable information. It was well-received, and the content is evergreen. Perhaps you used chunks of text, broken up by images or photos, in order to maintain interest. Can you turn that content into a slideshow, an infographic, or, better yet, a video? When you do that, the opportunities to post on social media increase. And if you carefully choose the platforms and the days and times of day to post , you have the opportunity to pull in lots of new readers who may then turn into leads. You may have a post with really valuable content that fell a bit flat. It may have been because the title and writing style was boring. You can take that same topic and information and re-create a post. Use some of the title generator tools out there to spice up your headline. Improve writing style to add catchy sub-headings; find related data that will shock your readers. If, for example, you have written a post on student loan debt, would your readers be surprised to learn that cumulative student debt by the end of 2016 reached $1.3 trillion? Probably. Millennials, in particular, the largest social media and online purchasing group will probably be engaged by such content. You may have evergreen content that can be tied together in several posts you have written. Tweak them to be more engaging and promote them as a series that you will be posting over the next week or two. And if there are quite a few, add visuals, update the content and put them together as an e-book which you can offer for free in exchange for email addresses. New leads - done and done. With some research , you will be able to find the most current keywords for your niche. Go through those old posts, take out old tired keywords, and replace them with the most current. This should certainly improve your SEO results. Just be certain that your content is up to date too. And make sure that your keywords flow naturally within your content. Google frowns upon awkward sticking in of keywords just to get them in there. This is the easiest of all. You may have new audience members who have not read your older posts. And yet, you know that there is value for these members. In your current posts, put links to these. On your social media posts, write creative "teasers" with links to that content. Mobile users love visuals and videos. They are in a hurry, their screens are small, and they don't like swiping through walls of text. When you turn old posts into visual content, be certain to test compatibility for mobile devices. People who would not have read your earlier text will be much more likely to view your visual representations of that content. When you can tell a story, and, even better, when you can do it with visuals, you will have winning content. Look through those old posts and see how you can turn them into stories for an Instagram carousel or a Snapchat series. You now seem more "with-it," especially if you are cultivating a younger audience. As you remodel your old content, think about offering "upgrades." If you have lots of information to impart, offer a shorter version, with a link that will also capture an email address for the download. You would be surprised how many will take you up on that, and you now have more leads. You have probably noticed that there are some common threads running through these ideas - creative engaging text, when you must use text, and the importance of visuals . No matter what the demographic of your target audience(s), the web has turned all of us into seekers of instant information, with attention spans that last about 8 seconds. Those 8 seconds can be elongated if we present content in engaging and entertaining ways. As you look to re-purpose your old content, keep in mind these short attention spans, the need we have for visual and video-based information, and the critical aspects of titles and creatively composed text. Elaina Meiser is an experienced blogger and marketing expert for essay writing service getacademichelp.com. She loves to write about internet marketing, blogging tips, and web design. Follow Elaina on Twitter.